These feel-good (and flourless) cookies are made with calming, quality ingredients. Plus, each one contains 2g filling fiber and 4g of satiating protein, thanks to a few power add-ins. Whip up a batch and enjoy! Preheat oven to 350°F. Mist a baking sheet with nonstick oil spray or line with parchment paper and set aside. Puree chickpeas in a food processor and then add to a large mixing bowl with remaining ingredients (except chocolate chips) and combine. Fold in the chocolate chips. *Alternatively, you can toss all ingredients (except chocolate chips) into a food processor, and pulse until chickpeas are pureed and everything is well combined. Do not overmix. Scoop the cookie dough into balls (about 1 heaping tablespoon each), and place on prepared baking sheet. Gently press down on each cookie with the back of a fork—in two different directions to make a criss-cross pattern (if the batter is too sticky, mist the fork with oil spray). Bake for about 15 minutes. They’re extra delicious served soft and warm. Nutrition info provided per cookie. 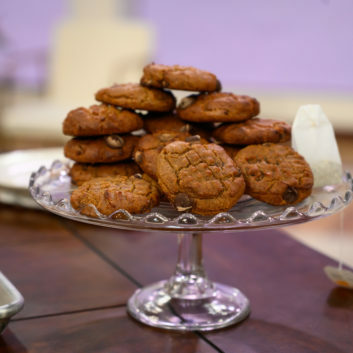 I’m betting you’ll also love these Soft-Baked Chocolate Cherry Oatmeal Cookies!